Hot off the presses (or at least swiped from dropkickmurphys.com) are the most up to date Paddy’s day tour dates. Note the gig on the 18th at the Brighton Music Hall – its pay on the door admission only – anyone remember the last time the DKMs played a non ticket event in a Boston area club? The Middle East in Cambridge for the Do or Die release party, there was a frigging riot outside by those who couldn’t get in. The new Dropkick Murphys album entitled “Going Out In Style” will be available in stores and online on Tuesday March 1st 2011. Dropkick Murphys BOSTON ST PATRICKS DAY SHOWS ANNOUNCED! Tickets for the 1st three announced Paddys Day shows are going on sale this Saturday, October 16th at 10am EST! The DKMs are busy working in the studio writing new material for an album which they plan to release in conjunction with their St Patrick’s Day tour. DKM Aussie Tour……..No Sleep Till…. Hammersmith, Brooklyn, Auckland, Perth, Adelaide, Melbourne, Sydney, Brisbane. DKM head to Australia and New Zealand in December to not only avoid the cold New England winter but to play the No Sleep Till…..serious for festivals. Other bands playing include: Megadeth, NOFX, Parkway Drive, GWAR, Alkaline Trio, Frenzal Rhomb, August Burns Red, Suicide Silence, Katatonia, 3 Inches of Blood, We Came as Romans, Antagonist AD, Leeches, Outsiders & Shitripper……heres to GWAR taking a chainsaw to Dave Mustaine. Dropkick Murphys will be playing the Bonnaroo Festival in Manchester TN, Sunday June 13th. Also on the bill will be Tori Amos, Nora Jones, Daryl Hall and GWAR! 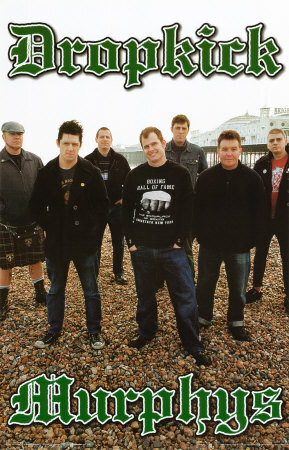 Dropkick Murphys have just announced they will be playing 7 dates on 2010s Vans Warped Tour.